American fashion brand Guess today unveiled its latest smartwatch powered by Android Wear 2.0. Just like its predecessor, it is named Guess Connect, and it's powered by the latest Qualcomm Snapdragon Wear 2100 chip. 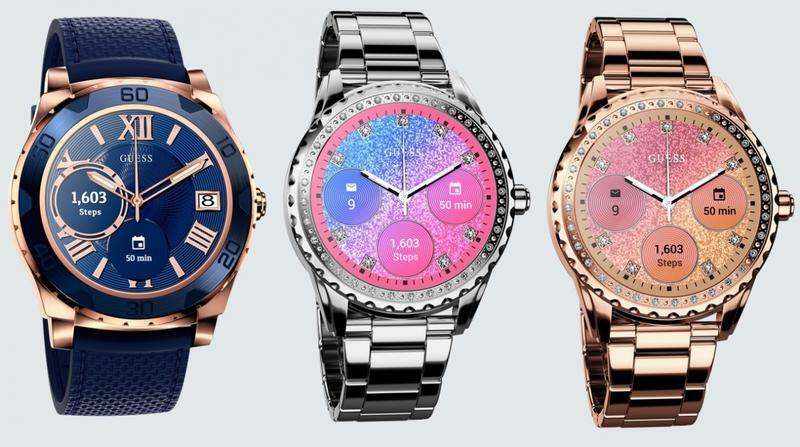 Guess' first Connect smartwatch was kind of a hybrid device that combined a traditional wristwatch with a small few smart features using a tiny digital display integrated into its face. It left a lot to be desired, but Guess is hoping to address that with its latest model, which adopts Android Wear to become a truly smart wearable. The Connect will be available in 41mm and 44mm sizes targeting females and males respectively. One of the eight styles looks a lot like the original Connect, while the others will offer jewel-encrusted metallic finishes in gold, rose gold, and silver. "We're told that over a hundred combinations of display face, colour, and subdials will be available," reports Wearable. We know the Connect will be powered by a Snapdragon Wear 2100 chip, but that's about all we know about its internals for now. The device will get its full unveiling at Baselworld 2017, which kicks off on Thursday, March 23, in Messe Barsel, Switzerland. We should also find out how much the device will cost then, too. The Connect won't go on sale until "Fall / Winter 2017," Guess says, so there's plenty of time to save up for it if you like what you see later this week.